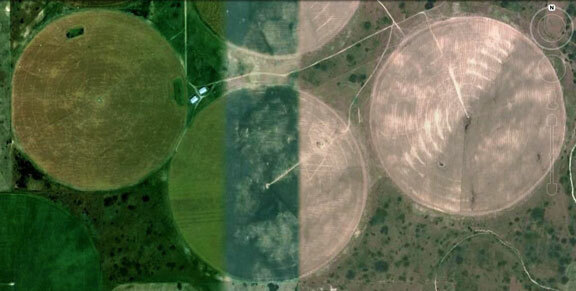 This South Central Kansas Hunting aerial is just a segment of one deer lease. We have zoomed in as close as we could to show detail while keeping distance perspective. Each pivot irrigation circle is 1/2 mile wide. Not a tree for a stand. The best tag-on success lease in the Association within units 16 and 17. Not bow friendly. Long range rifle country where the three legged stool and great patience for glassing is required. We actively discourage traveling hunters from putting in for a unit 16 deer tag. It is the toughest whitetail hunting we have. This unit also overlaps with Mule Deer. About a 50/50 ratio. Before anyone applies for a unit 16 tag we strongly encourage that hunter scouts that land thoroughly. It is the case proved every couple of years that those experienced tree stand deer hunters who hunt any of the wide open prairie lands including until 16 tell it was a terrible hunt. Most will not come back. It is also true some of the biggest whitetail deer harvested in the Association has come from this type of cover. And, we again will state in the most explicit of terms that 99% of those that attempt a self guided deer hunt on this terrain do not see deer. This land is classic Kansas bird land. The hunters that see the most trophy whitetail are bird hunters. Not deer hunters. Kansas deer management unit 16 is shown on the map at left. This has the bulk of the Association lease land. Unit 17 that adjoins to the north has some more Association private hunting land. 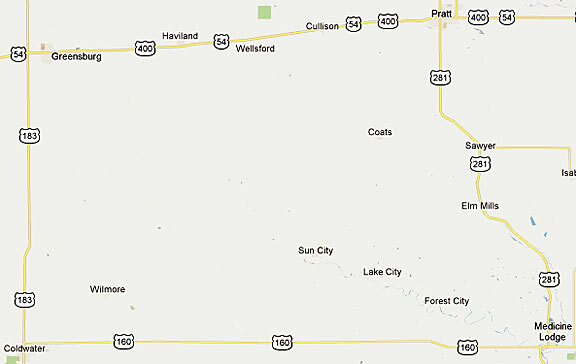 The largest nearby towns are Greensburg, Pratt, Coldwater and Medicine Lodge Kansas. The east west access highways are 56 and 54. North south highways are 183 and 281. Unit 16 is an all weather hunt unit. The sandy composition of the soil allows for dirt road travel regardless of rainfall. What is unique about this sandy soil is shown during dry weather. The sand pulverizes and loosens to the point that back roads travel is slowed, not stopped by truck tires digging into the dry lose sand several inches. To give a reference for how desolate this region is void of permanent residents or towns is the map below. To travel east to west on that small segment of a map is a hours drive at highway speeds. The travel distance between Greensburg and Medicine Lodge is Long. The hunting spot location nearest to one or the other should be the preferred lodging location. Both Greensburg and Medicine Lodge have grocery stores and several motels to choose from. Bring a second set of vehicle keys carried in other than the pocket of the primary vehicle key set. Fix-a-flat or can tire inflator may give that extra time to get to town to fix a flat. Have cash available and stored elsewhere than a wallet.